Almond and Coffee Cake- The Cardamom Trail. A few weeks ago I got a copy of Chetna Makan’s new book The Cardamom Trail. Chetna was a semi finalist in the 2014 series of The Great British Bake Off . Her bakes were unique in that she added in the spices she grew up with and then gave them a unique twist. I love adding different flavours to recipes and some of Chetna’s creations seemed so mouthwatering. It took me a while to get round to trying out a recipe from the book. It was so difficult to choose which to try out first but I needed an opportunity to get the mixing bowl out. Last Wednesday I was at home and once again the urge to bake something overcame me. I had picked my son up from school from his GCSE exam and was trying to put off doing the ironing. As you do! My mind wandered to what I could bake. I’m trying not to eat too much sweet stuff (famous last words) but I knew I was going to be teaching in one of my regular schools the following day and I sometimes take cake in for the staff to try out. As I browsed through the book several recipes leapt out at me. But one which stuck in my mind. It was for an Almond and Coffee Cake which sounded delicious. It was also one which contained ingredients I already had in my baking stash. Including a mountain of flaked almonds and ground almonds which needed using up as soon as I could. Chetna says “I love the combination of almonds and coffee. Normally it is associated with rich desserts, such as gateau opera but in this cake the sponge is made with ground and flaked almonds which makes it light. The richness comes with the buttery chocolate icing and can be topped with yet more almonds!” So not only will the cake taste fantastic, it will be simple to decorate with a sprinkling of almonds. In the gorgeous photo of the cake it is shown baked as a bundt. 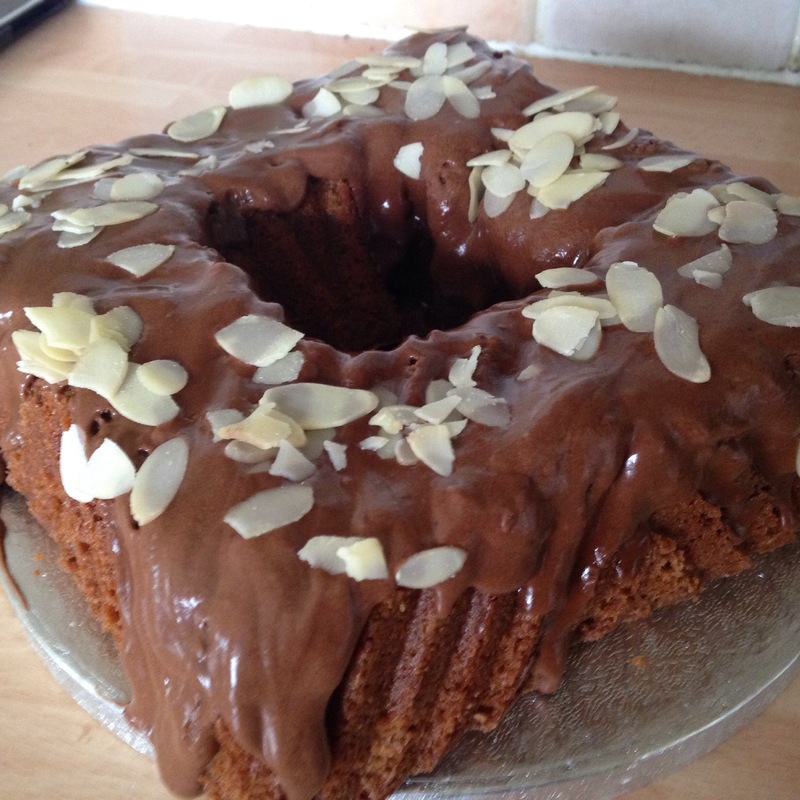 Though for those who don’t have a bundt pan, the cake can also be baked in a 25cm diameter circular cake tin. Me being a bundt addict and an avid collector of all things bundt I was keen to get out one of my pans. I chose my square one which was a Christmas present to bake the cake in and made sure it was properly greased with Wilton Cake release. First some butter and sugar was creamed together with my hand held electric whisk. Then I added three large eggs, beating them well after every addition. Then in went some self raising flour, baking powder, ground almonds, some coffee and milk. The coffee was actually 2 tablespoons of very strong coffee dissolved in boiling water. This was all mixed together and well combined. In the mixture went into the bundt pan but I was concerned as the mixture only seemed to fill half the pan. Really it should fill three quarters of the tin so maybe the tin I used was too big. I hoped the cake would rise a lot in the oven! Baking is normally a relaxing experience for me but today I was a bit impatient to get the cake out of the oven and finished off. Looking back it was getting near tea time and I had to sort out other jobs. Why do I do it? I forgot what time the cake went in the oven and didn’t set the timer. Then with that I looked at the cake too early. When the cake was ready it looked like it hadn’t risen much. Maybe the bundt tin was too big. At least it was one where it didn’t matter if the top half was missing. Thankfully also the cake came out of the tin in one piece! Then it was time to slap the icing on and I mean slap or throw it on! I made up the icing by melting some butter in a small pan on my hob. When it was melted I took it off the heat and mixed in some icing sugar and some cocoa powder mixed into a paste with boiling water. 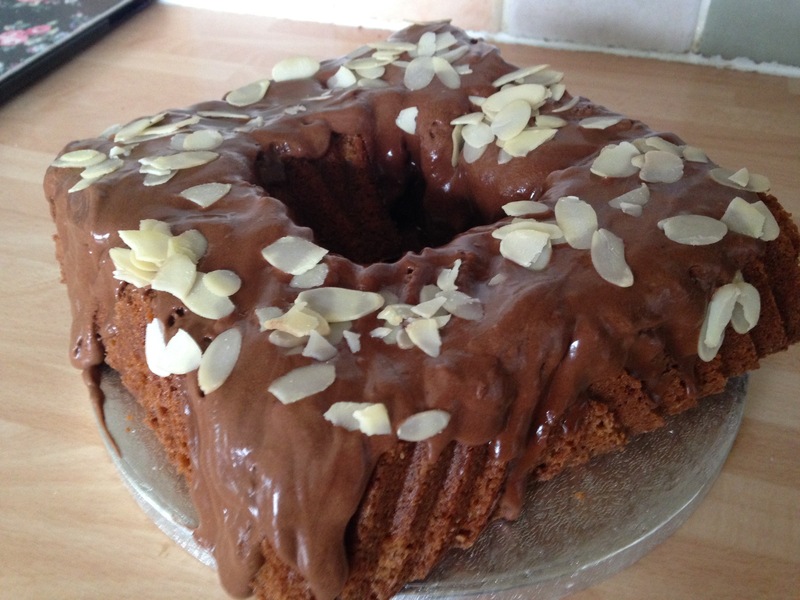 The icing was runny but was ideal to spread on the cake and clung to the grooves of the bundt. The final finishing touch was to sprinkle the flaked almonds on top of the cake! The following morning I took the cake into work. It went down well but I left the cake there so I don’t know what happened to the rest of it. I collected an empty box the next time I was in. I didn’t try any myself though. I need to try it again, would be a perfect cake to bake if you have friends round for a cuppa or to donated to a coffee morning. Previous Post Graeme Clark’s Gig at Siempre Bicycle Cafe, Glasgow- A Review.